A close view of an ultra-distant fossil is helping to answer questions about the formation of planets throughout the universe. NASA's New Horizons probe buzzed the outer solar-system object early on New Year's morning, making the first flyby of such a primitive object. Because 2014 MU69 has remained virtually untouched since the birth of the solar system 4.5 billion years ago, it can reveal new details about that era. Already the first puzzling photos are helping to prove models of the early solar system. "We picked a cold classical object for a very specific region, because that's where the evidence was heading," Alan Stern, the New Horizons principal investigator and a planetary scientist at the Southwest Research Institute (SwRI) in Colorado, told Space.com. Stern said that a mission like New Horizons was the most direct way to get information about the dawn of the solar system. New Horizons delivered. The newest images released yesterday ( Jan. 2) reveal a snowman-shaped object with two lobes, one roughly three times the size of the other. During a news conference, mission scientists said that the only way for such an object to form was by coming together at very slow speeds — less than 1 mile or kilometer an hour. "If you collided with another car at those speeds, you may not even bother to fill out the insurance forms," Jeff Moore, New Horizons co-investigator from NASA's Ames Research Center in California, told the crowd. These slow formation speeds help to validate a recently proposed model of solar system formation known as pebble accretion. Under that model, the gas and dust left over from the formation of the sun slowly comes together as tiny objects, pulled by gravity. "It's incredibly satisfying to see that confirmed by the data," Stern told Space.com. Trying to understand how planets form is a challenge. We can't rewind the process in our own solar system, so scientists peer at the asteroids and Kuiper Belt objects (KBOs) that were left behind after the planets formed. Objects like these probably started out as bits of gas and dust that were pulled together by gravity, in tiny clumps referred to as pebbles. Unlike the pebbles in your driveway, however, the pebbles of the solar system can be as large as giant boulders; the idea is that they are smaller than the planetary embryos known as planetesimals. Peering into other planetary systems can help scientists understand this period in solar system history some, but not a lot. The cloud of gas and dust that births new worlds also hides them, concealing them in a shroud of material. So researchers mostly rely on models, computer programs that work to simulate the process of planet formation. By looking at the results of planetary systems, researchers can get an idea of the limits behind their formation. In 2012, a pair of researchers from Sweden proposed the pebble accretion model, in contrast to contemporary theories suggesting gas and dust gathered together to create kilometer-size objects. The model was imperfect, and in 2015, theorist Harold Levison of SwRI suggested some refinements. The theory described how as the objects grew from centimeter-size pebbles, their gravitational fields would push and pull at one another. The nudges would have knocked some embryos out of the gas and dust, separating them from the material they needed to grow larger, while those that remained in the disk gorged on pebbles to grow into planets. 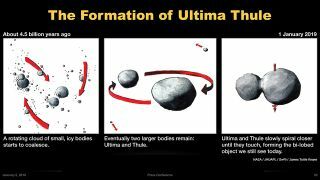 The most recent images of MU69, which the team has nicknamed Ultima Thule, seem to prove the pebble accretion theory, Levison said. The two small objects on the KBO bumped at slow speeds that suggest a relatively calm period of accretion, when pieces of material are piling onto one another, rather than a fast and dangerous birth. Levison, who is not a member of the New Horizons team, is the principal investigator for an upcoming mission to one of the asteroids around Jupiter. "The big news is the accretion story," Cathy Olkin, New Horizons' deputy project scientist at SwRI, told Space.com. That picture of how solar system objects formed is supported by the fact that the object's two distinct lobes are joined by a narrow neck rather than a thick, unwieldy one. Pebble accretion might also help explain why MU69 has no apparent satellites, despite the fact that the team anticipated finding large rocks or moons in orbit in the years and months leading up to the flyby. "It's really astounding that we don't see anything in orbit," Stern said. According to Levison, if MU69's bilobed shape was formed by pebble accretion, the process would have ejected smaller leftovers that didn't accrete onto the KBO fairly quickly, leaving no satellites for New Horizons to spot. Of course, it's still possible that newer, better resolved images that will be sent to Earth in the coming days may reveal such satellites. The preliminary findings, however, seem to make MU69 a smoking gun for pebble accretion, providing an observational match to what was last week only a theory. That find alone has important scientific implications, and the rest of the information New Horizons will unveil over the next two years will surely shed even more light on the process. "This is big physics, [as if it were] a particle detector and we just now found the Standard Model," Stern said with a large grin, referring to the theory of fundamental particles and how they interact. "I think we should be nominated as a mission for a Nobel Prize," he said. Follow Nola Taylor Redd on Twitter @NolaTRedd. Follow us on Twitter@Spacedotcom and on Facebook. Original article on Space.com.